First LPs, now cassettes? What happened to quality??? So there is a trend in "audiophiles" collecting cassettes and claiming the obvious hiss, audible wow & flutter, phase shifting treble, and limited frequency response is "more real" sounding? If I spoke with those artifacts in my tone I'd be quarantined for months before they could clear me of having an epidemic contageon!!! There must be an epidemic of ear infections ruining people's hearing. What's next? The victrola offers the pinnacle in sound quality? Naa just the guys with a sh*tload of cassette tapes they are trying to dump. I know that Scott from Fu Manchu will have their recordings put on cassette and play them in his El Camino to judge if the recording is to his liking.......I don't get it. Upcoming BIG improvement in audio media! Don't forget to use the gum wrapper wedged between the player and tape, improves dynamic range, and sounds more realistic. New one for me. I didn't think they still made 8-tracks in '85 (when that album was released). I still have that one on cassette some where. I actually have a couple of cassette tapes the I would still like to get converted to any type of digital format, CD or whatever. I have a couple of demo tapes of my nephews old band from the late eighties and early ninetires. The quality was never good, but I would like to have them and be able to keep them, but alas I have now way of doing it. First came the 4 track tape, didn't last long. 8 track was introduced right around 65 - 66, and believe me, be grateful you were never exposed to the finer qualities of 8 Track. What a PITA. If you have a cassette deck anywhere, go to the Rat Shack and get a mini plug to RCA adapter or cable. Then go and download Audacity on your PC and you're set to go. I haven't had a cassette player anywhere but my cars for clost to twenty years. I haven't had a cassette player in a car for probably 15 years. PITA? What are you crazy? 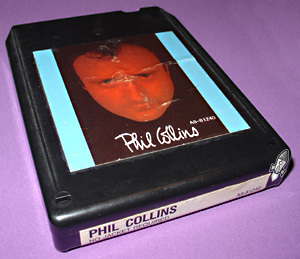 8 track rocks! Especially when the music would fade out (in the middle of a long song), you hear a loud "KACHUNK! ", followed by the music fading back in. I haven't had a cassette player anywhere but my cars for close to twenty years. I haven't had a cassette player in a car for probably 15 years. Check the Gon or Fleabay. Maybe even check some of your local pawn shops or Goodwill (you'd be surprised at that one). I bet you could find a good one for under $50 easily. I can vouch for that. I purchased a Yamaha cassette deck in excellent condition at a thrift store a couple of years ago. They still show up from time to time. That Yamaha is much higher quality than a new Sony I purchased many years earlier. I still gots my Nakamichi deck (DR-8).